Pat-t-Shirt was founded in 1976 by Patricia Rickard of Niles, Ohio. Our business began on the road where we traveled to fairs, festivals, drag races, van-ins and many concerts. 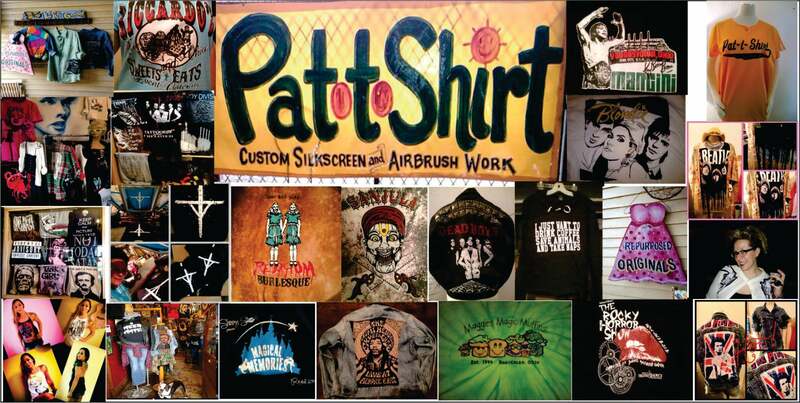 Pat airbrushes, sign paints, designs custom artwork, has cut out thousands of silkscreens, pin-stripped, airbrushed on autos and motorcycles, sewed tackle twilled satin jackets and is an awesome Mom to 2 kids, Kerri and Mike raising both in the screen printing business. Kerri is continuing on with her into the new era of screen printing where she is developing/creating/showing her own line of re-purposed and vintage clothing. Kerri and Pat have already created many custom pieces for musicians, artists, wrestlers, stage and screen performers! Pat-t-Shirt was once located on 422 right across from the Eastwood Mall in Niles, Ohio in the early 80's, later moved to Lincoln Ave. in Youngstown, Ohio during the late 80's and has printed shirts for some of the following artists: The Ramones, Youngstown's own "The Dead Boys" and "The Stiv Bators Band", Blondie, Devo, The Talking Heads, Patti Smith, and many more. They traveled to NYC and sold shirts in stores and concert venues like CBGB'S, Akron/Cleveland/Youngstown Agora, Tish and Snookie's and Screamin' Mimi's clothing stores. We have also printed for MANY business in the NE Ohio area and in the late 70's to late 80's were known to "Cover your bod with the best work around." We are continuing that mission, a dozen t-shirts at a time! What makes us different from other screen printers? Pat and Kerri. :) A mother/daughter team that provides their customers with ORIGINAL artwork for your business and personal needs. We are not a company heavily dependent upon computer-created artwork. We are also SIGN PAINTERS and able to personalize your home and or business even your automobile/motorcycle with hand-painted items too! Our abilities are wide-ranging. We will make every effort to make your screen printing job personal and friendly while offering reasonable/competitive pricing! Kerri also takes Pat-t-Shirt on the road with screen printed t-shirts and re-purposed clothing. Here's just a few places where we have attended: VEXFEST 2015 in Youngstown, Ohio, Barekuckle tattoo in Austintown for their 5th anniversary, Ohio, Crafts and Drafts at the Rustbelt Tap Room in Youngstown, Ohio, Square Fest in Akron, Ohio, The McDonough Museum Art Sale, Sharon, PA's ARTIGRAS at the Quaker Steak and Lube. Sharon, PA's "WATERFIRE." The Sharon PA Bavarian Fest, The French Market at the Canfield Fairgrounds. Supported and printed the first shirts for the Little Steel Roller Derby Girls of Youngstown, Ohio. We also support Youngstown's Women's Rugby League (they also model for us!) We were awarded the in-house printing privileges of the Youngstown Playhouse's 2012-2013 season. We also have printed for the Oakland Theater of the Arts, Kent State University and Kent State University Trumbull Theater. We hope you will be our next customer or would like to have us as a vendor at your event!